I am totally obsessed with surprises. I love them. I love the idea of getting to try something I wouldn't have normally thought to purchase, and that's exactly what I get with Bulu Box. 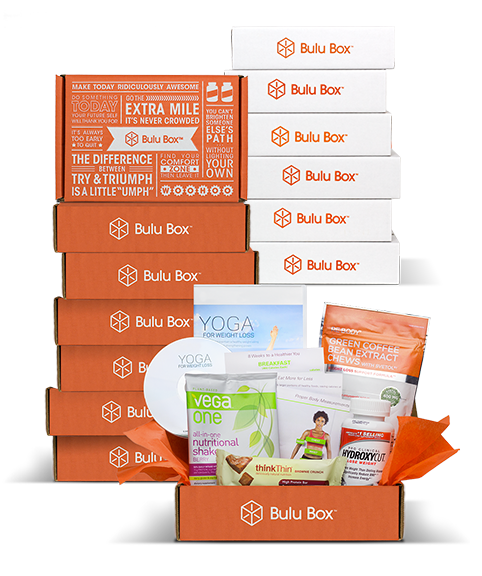 Bulu Box is a monthly subscription (or one time purchase!) box full of vitamin, supplement, health and weight loss products! Each Bulu Box contains 4-5 premium samples plus lifestyle extras from time to time. Each box is a feel-good discovery. What was exciting for me, and my husband, is that we had seen almost all of the products before that were in the box, but at $30 or so for each full size item, it was hard to buy it to see if we liked it. If we didn't, we were out $30, so this way we could sample many different kids of products at a low price. A one month Bulu Box subscription is only $10, and it ships free! A 3 month subscription is $30, 6 months, $60 and 12 months $110. You can view all the purchase options here.